On May 14th 2014, the 4th Mozilla Seoul code party happend in Daum Hannam office. 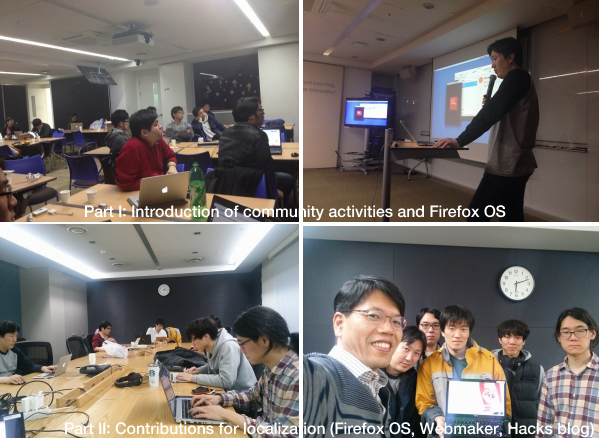 This event was prepared for Korean pre-volunteers to be interested in both community activities and Firefox OS app developments. The 28 people were gathered and talked about Mozilla’s mission and activities. Most of them are interested in Firefox OS’s status. After Part I, we gathered remained people to join localizing contribution Webmaker websites, Mozilla Hacks etc. Total eight people started to work together from 11pm to 6am in next day. Thanks for your attendance and see you soon. You can see code party results via Ehterpad.